Jan. 30, 2018, 5:37 p.m. 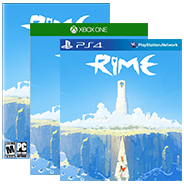 In December we promised you an update on the status of the RiME on Nintendo Switch. Our teams have been working tirelessly to develop a patch that would address some issues that could be resolved through an update. We have QAed the patch and submitted it for approval to Nintendo and are waiting to hear back. The patch is larger than normally permitted, so we may get denied on that basis.. If the patch gets approved we’ll announce what the changes at that time. That being said, we have not determined our path yet. Right now we’re facing a balancing act, as improvements in some areas may have issues in other areas. As such, we're still investigating the best balance. We will be providing you with our direction in January, so please keep an eye on social media for that announcement. Jan. 6, 2018, 7:06 a.m. I finished RiME on Siwtch and the critics were really ruthless! I did not find the game as catastrophic as they say. There are indeed some worries mainly in the first world but the experience remains intact. RiME is a wonderful game that I discovered by ignoring critics. Thank you, I hope you will come up with solutions to silence the bad languages! Jan. 9, 2018, 11:07 a.m.
Feb. 12, 2018, 6:21 a.m.
i mean That being said, we have not determined our path yet. Right now we’re facing a balancing act, as improvements in some areas may have issues in other areas. As such, we're still investigating the best balance. We will be providing you with our direction in January, so please keep an eye on social media for that announcement.